Axis bucks don’t bugle like elk or roar like stags. They have a very distinct vocalization and once you’ve heard it you won’t ever forget it. I don’t know what it’s called, but I call it screaming. June isn’t the typical hunting season to most people, but if you want to shoot a big axis buck in Texas the 2 best months to hunt are May and June. I had been on several different ranches scouting for axis leading up to this hunt and on every ranch I was on the axis bucks were screaming like crazy! It was mid June and the axis rut was in full swing. It was going to be a great hunt and I couldn’t wait for James to show up! 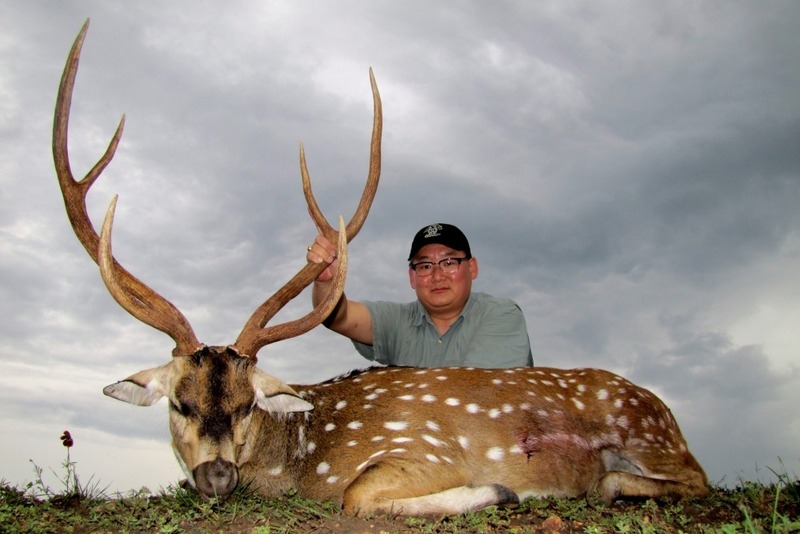 I had met James at the DSC convention back in January of 2012 and he mentioned he was interested in some axis hunting, but he wanted to get one bigger than the two he had already killed and that meant we were after an axis buck that was 32″ or longer. The ranch we were hunting has some great axis bucks, and I was confident we could find him an axis over 32″, but I knew it wasn’t going to be easy and would require some time so I arrived at the ranch a couple of days early to do some scouting. I was also hoping to get to do some scouting for red deer on another ranch that was right down the road, if time allowed, so as soon as I got all my gear unpacked and I was settled in Lewis, the ranch foreman, and I headed out to find James a big axis buck. We hadn’t even gotten out of sight of the lodge when I spotted a HUGE axis buck! What a way to get started on this Axis Hunting Adventure! This buck was a monster that would go well over 32″ and he had at least 12″ eye guards. He was laying in the shade in an oak mott with about 10 axis does and a couple of smaller axis bucks. I knew immediately that this was the buck I was hoping I could get James on, but I also knew that limiting ourselves to hunting 1 specific axis buck wasn’t the smartest idea so Lewis and I continued our search around the ranch. As we continued our lap around the ranch we saw some great whitetail bucks in velvet, some monster fallow bucks that would be out of velvet in about another 2 months, a few kudu, blackbuck and numerous great axis bucks. Rain storms had been building to the south and the cool temperatures and nice breeze had made it a very productive and enjoyable afternoon driving around scouting and visiting. The rain storms had really been building while we were out scouting and as we crested the last rise heading back to camp we knew we weren’t going to make it back to the lodge before the rain hit, but after the drought we’ve had in Texas all the rain we had been getting the last few days was a welcome sight. As I sat on the front porch watching the rain roll in I couldn’t help but think about the monster axis buck we had seen right by the lodge and really hoped I could get James on him. We had seen several other great axis bucks that I knew James would be super happy to get, but that first axis buck was an absolute brute. The next morning I was up before first light and headed out in search of the monster axis we had seen the previous afternoon. The previous few days rain, and the light showers that had started as I left the lodge, made the leaves and ground nice and soft and real quiet as I eased into the oak mott where we had spotted the huge axis the previous afternoon. It didn’t take long before I started seeing small axis bucks and axis does, as well as a few whitetail, but I couldn’t locate the monster axis I had seen the previous afternoon. I spent a couple of hours easing through the oak mott and finally came up on a herd of about 50 axis deer. The rain had made the ground super soft and quiet, as well as kept my scent down, and I was able to get well within 100 yards of the whole herd and really look them over. I sat there for about 45 minutes watching all the axis deer. Some were napping while others were up grazing on the fresh new growth the rain had provided, several of the smaller axis bucks were sparing and the biggest bucks were just sitting there watching over their harem. It was an amazing site that I’ll never forget, but unfortunately I had forgotten my camera! I was so mad at myself. After watching them for about 45 minutes and not spotting the big axis buck I decided to ease out of the trees and head back to the lodge and grab lunch and wait for my buddy Ruben to show up before we headed back out. Ruben was in the area, and I had brought him some trailer axles, and he was going to help out on James’ hunt. The rain had kept it fairly cool and as more storms started to build there was a nice breeze and the conditions were perfect as Ruben and I headed out to do some more scouting. We only had a couple of hours before we were supposed to head to the other ranch with the red deer, but in the short time we had we located another nice axis buck that James would probably be happy with. Convinced we had enough axis bucks located we headed to my other ranch to scout for red deer and possibly shoot a couple of red deer hinds. Once again the cool weather and rain was in our favor and we saw quite a few red deer. We finally spotted a couple of red deer hinds and as I got set up to make a 400ish yard shot they ran into the brush. We still had a little daylight but despite our best efforts we couldn’t locate any more red deer hinds and headed back to the ranch where we would be hunting axis with James. When we woke up Friday morning it was raining so we decided to sleep in and not rut up the roads. We had a few hours before James was due to arrive and by the time we finished breakfast and our chores it had stopped raining enough for us to make a quick lap through the pasture. We were easing through the pasture, about to head back to the lodge, when I spotted the monster axis I had seen the first afternoon. He was down in a dry creek bottom with about 15 axis does and several smaller axis bucks. Luckily the wind from the rain storms kept the axis from hearing us and we turned around and eased our way out of the pasture and back to the lodge. We had the monster axis located, now all we needed was for James to arrive so we could go hunt! When James arrived we quickly got him settled in, all the final paperwork taken care of, and we were off the site in his rifle and begin his hunt. I knew which axis buck I wanted James to shoot, but I’ve learned over the years that it’s always best to let the hunter see a few bucks before he makes his decision. After getting his rifle sited in we headed out in search of axis bucks and it didn’t take long for us to get on one of the bigger bucks Ruben and I had located earlier that morning. This buck was screaming like crazy, the wind was in our favor and it had started to rain again. We eased right in on this buck and James and I talked it over for a few minutes but ultimately decided to see what else we could find. We headed toward the part of the ranch where we had seen the monster axis earlier that morning, parked the truck and the stalk began. We had only gone about 500 yards when we spotted a few axis browsing in the creek bottom. There was a lot of fresh vegetation from the rains and the axis were really enjoying all the fresh groceries. There was no way to get across the open field we needed to cross without these axis seeing us so we had to double back and come in from a different direction. After circling around and coming in from a different angle we eased our way back down towards the creek bottom. When we got to down in the creek bottom we couldn’t find the herd of axis and thought they might have seen us and spooked, but after a couple of tense minutes we spotted the herd feeding away from us. They had all gotten up and were feeding their way out into an open field on the other side of the creek bottom. The soft ground made the stalk much more quiet and we quickly closed the distance to the herd. Unfortunately for us, as soon as we got back up on the axis herd they bedded down. We were kind of caught out in the open but were able to make it to a big oak that had fallen over for cover. The only problem was that unless we were crouched over we were visible from the top of our shoulders up. We made the best of what we had, but I knew we would be lucky if we didn’t get busted. Our luck was holding out until a whitetail doe walked to within 20 yards of us, spotted us, and began blowing at us. Despite us throwing rocks at her and trying to get her to leave, all without spooking the axis, she blew at us for about 2-3 minutes. Luckily it had started raining harder and the axis couldn’t really tell what had her spooked and she finally had enough and ran off. We kept searching for the monster axis buck, but from where we were at we couldn’t find him. I knew he was in the herd somewhere, but where? I decided to ease back into the creek bottom and circle around to a different location and see if I could spot the monster axis buck. Once I got to my new location I had a much better view of the whole herd and after locating the big axis buck I motioned for James and Ruben to make their way over to my new location. Just after they made their way to my location and got up under the canopy of the tree I was hiding behind the sky opened up and it really started to rain. The thick canopy was keeping us pretty dry, so we just got comfortable to wait for the rain to pass. I knew once the rain let up that all of the axis would get up and keep feeding their way out into the field and when the big buck got up we should get a shot. After waiting about 25 minutes the rain finally let up and right on que the axis began to get up. The axis does and smaller bucks were the first ones to get up and begin feeding away from us, but our monster buck was pretty content where he was at and wouldn’t move. Finally, after all of the other axis had gotten up and were feeding away from us, the monster axis buck we were after stood up, but when he stood up he took a step forward. When he stepped forward he stepped right behind a big oak tree and there was no shot. James had a solid rest on the shooting sticks so we just waited, and hoped, that the monster axis buck would take another step forward and give us a shot. After about 2 minutes, which seemed like an eternity, the monster took another step forward and cleared the oak tree he had been hiding behind. He stepped into a small opening, James made a perfect shot, and the monster axis buck took about 2 steps and fell over!! As we walked up on this buck there was no ground shrinkage. He was huge! Well over the 32″ mark that James had set for himself. Since it had rained so much we went back and got the jeep, so we wouldn’t rut up the roads, went and took pictures and got back to the skinning shed just before the sky opened up again. This time the rain was even harder than while we were out hunting and we were all happy to be under the skinning shed with this monster axis buck. After we got him field dressed and in the cooler we were all sitting on the front porch grilling bacon cheese burgers, reliving the hunt, and trying to decide if we were going to go after an axis doe in the morning when Ruben looked up and saw a herd of axis deer feeding out into a field right in front of the lodge. James had decided he wanted to shoot an axis doe to take home some more meat, so he grabbed his rifle and quickly eased into position behind one of the many oaks in front of the lodge. 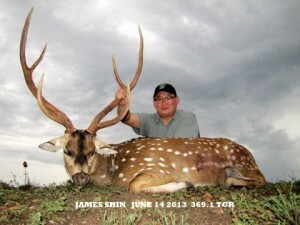 As the last light of the day was fading, James made a perfect shot and the big axis doe fell in her tracks. I handed Ruben the spatula, so he could watch our burgers, and James and I headed into the field to get his doe. We loaded her up and by the time we got her back and field dressed Ruben was taking the burgers off the grill. It was a perfect ending to the day! The next morning Lewis scored the monster axis buck. The more he measured the buck, the more he grew and he finished stretching the tape at a whopping 369.1 TGR!! Congrats James!! Thanks for giving me the opportunity to take you hunting!! It took us about 18 months to finally get together for this hunt, but it was well worth the wait! I’d also like to thank Lewis and Ruben as well. I really appreciate all the help! And that’s a wrap on another very successful axis hunting adventure with Double Diamond Outfitters. I hope y’all enjoyed it and thanks for reading. Axis deer can be hunted year round, so contact me, if you are ready to take a shot at your own axis deer!